Citrus (oranges in particular) grow in winter so we have *plenty* of them around at the moment. Once you realise that you can use citrus skins as fire starters this is actually highly convenient as winter is also when we’re cold – and lighting lots of fires. Good dots to join as composting large amounts, even small’ish amounts of citrus skin in small compost systems can be problematic. They just kind of hang around…. For ages. For this reason we hardly put any in our compost systems, instead we use them as fire starters for our wood fire inside our house. The oils inside the skin are highly combustable, so when you put a match to the dry skin it coughs and splutters into flame. Here’s a bad, out of focus photo of just that happening to the right. Sorry – taking a photo and playing with fire isn’t the best combo. To prep them for being fire starters we dry them until they’re crispy hard. 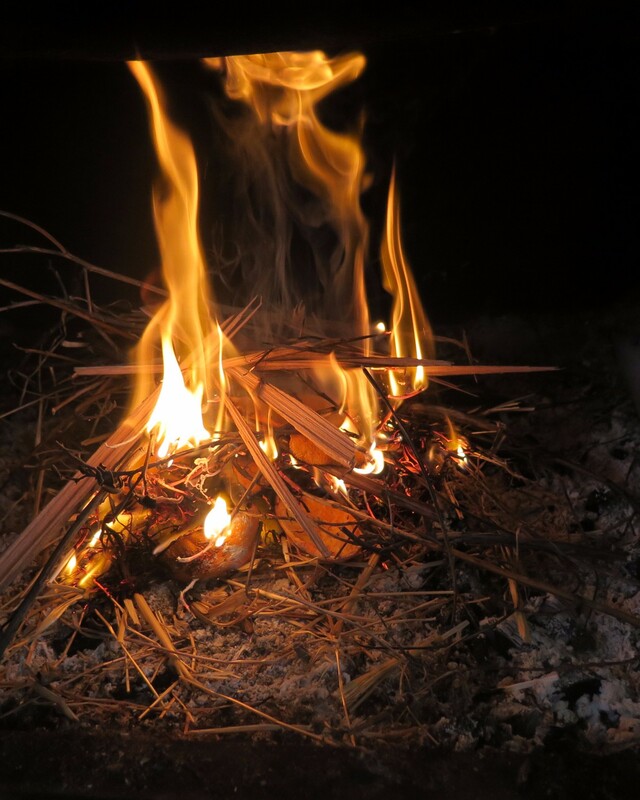 We do this by simply leaving them on top of our wood fire for one or two fires/nights. 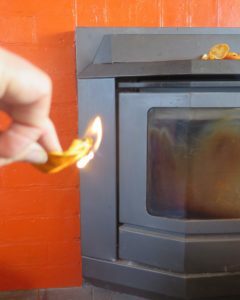 If your fire doesn’t have even a small top to place them on like ours does (we wish it was bigger), you can dry them in an oven on a low temperature – around 100 degrees I reckon. When you’re ready, stack your little fire with kindling and spread the citrus skins throughout the pile. 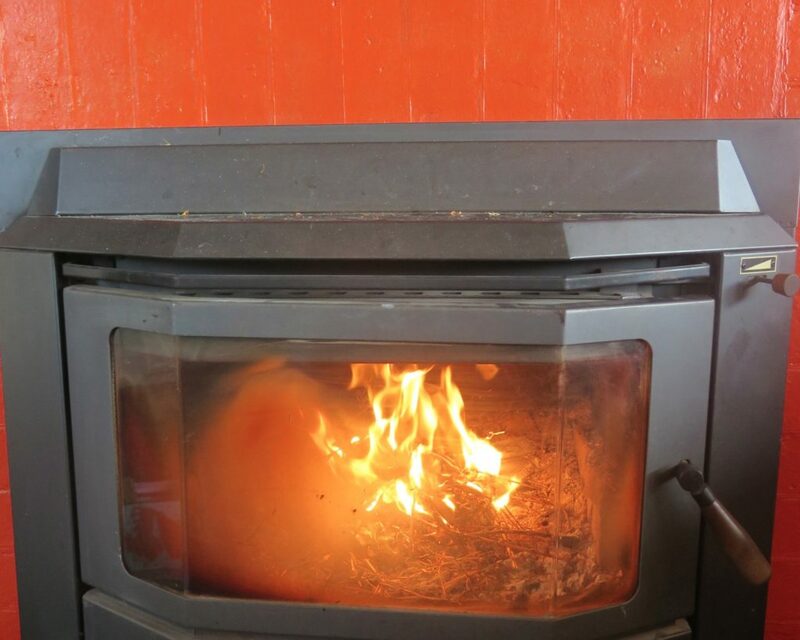 Simply add some fire and *Ta Da* – warm, citrus-smelling fire will arrive quickly. What if you don’t have a wood fire? 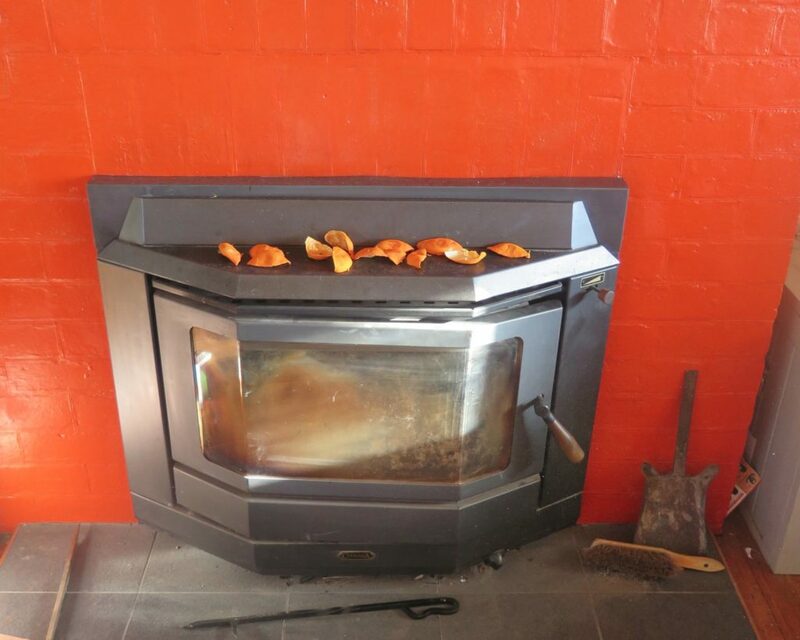 Of course if you don’t have a wood fire then another option for using up citrus skins is to make a potent cleaning product that can be used for cleaning your kitchen bench, floors, bathroom sink or toilet. Simply stuff your citrus peels into a glass jar and pour vinegar (any type) over it until fully covered. Leave it soaking for around two weeks, then drain the liquid off into a clean bottle for storage. Once you’re ready, pour it and some water into a container/spray bottle and use it. The ratio for water and citrus mix is around 50:50 ratio, make it stronger if you need to. 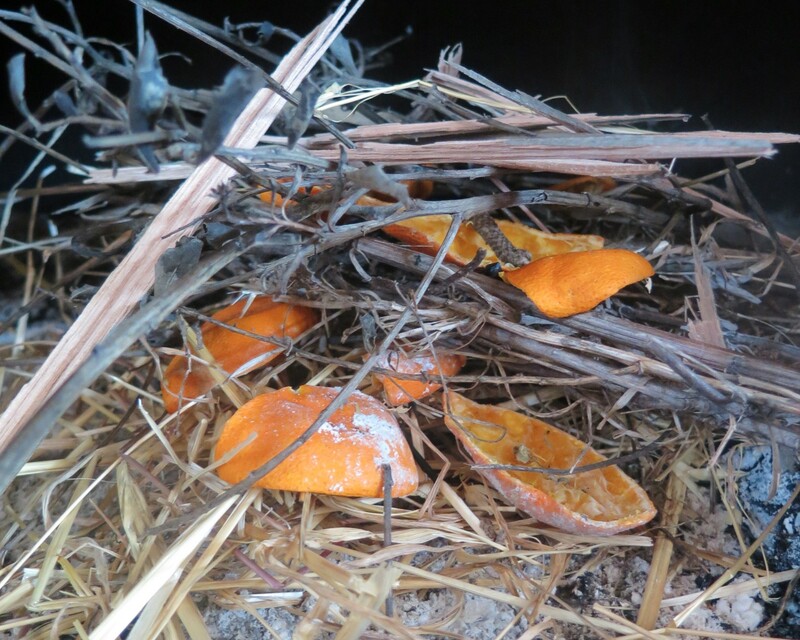 The great thing about this method is that after two weeks the citrus skins are so mushy that they break down quite quickly in a small compost system. Just remember to only add small amounts at any one time as the citrus/vinegar mix is super strong and could cause imbalance in your compost pile. Of course there’s only so much cleaning product you need, so it’s good to be able to have other uses for them too. Luckily you can also eat citrus skin in a broad range of ways, make a tea out of it and so much more – just spend 5 minutes on the world wide web and you’ll be sorted! 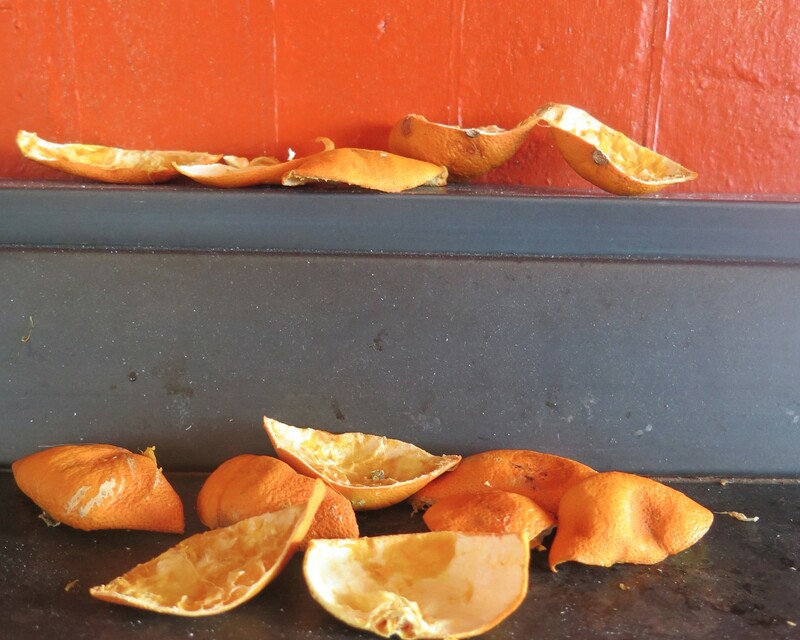 FYI – the citrus skin we do put into our compost bins is cut up into small pieces – around the size of a 50c coin, this at least helps it break down more quickly. This is part two of a blog documenting the development of our property design – you can read part one here, it’s where we show you our original design/s for our place and some of the big changes along the way. This blog is showing you our “final” design, I use inverted commas as it’s bound to change as we continue to implement it. Our friend and colleague, Dan Palmer calls this process of constant, responsive change Living Design. I believe any good designer/implementer does Living Design intuitively. It’s the act of choosing to NOT follow what the design on the paper says when you’re presented with new information/observations as you’re implementing it. This means the outcome is more true to you, the land and current reality on all levels. Simple stuff really, but surprising how often it doesn’t happen. So that’s why I used inverted commas, cause it’s gonna change – nothing too major at this point though as it mostly implemented. But change it will. It’s nice and broad on purpose, there are no design solutions or specifications in there – you’re just trying to capture the *vibe* of the place. A good design will also map the sectors for your context. 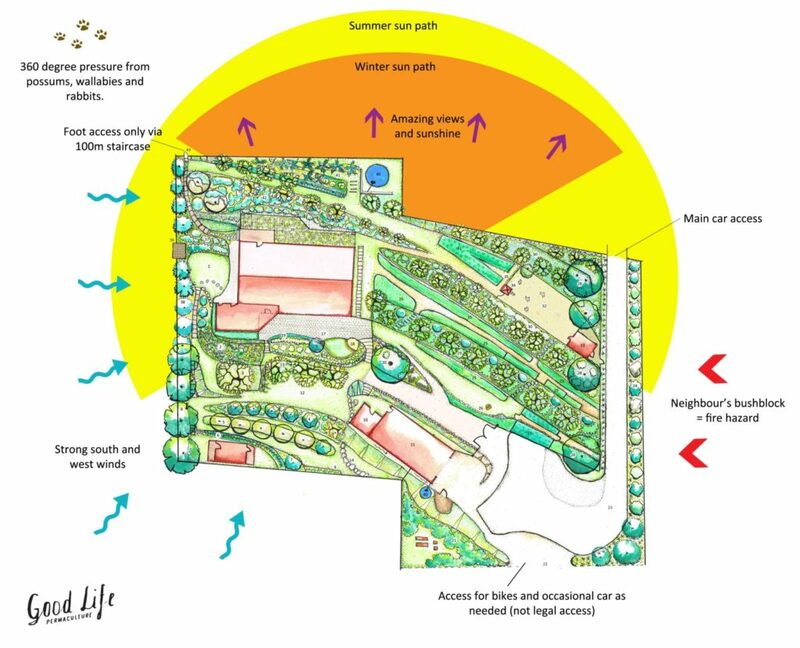 Sectors are the external energies that impact the site, meaning that when designing you need to address each one to ensure your design is the best it can be. Some universal sectors are sun (where is it shining from?) and usually wind (where’s it blowing from) and access (how do you get in/out of your property?). At our place, we have all these plus things like 360 degree pressure from wildlife (wallabies, rabbits and possums). Our design response is to fence the whole block. Another one is the *very* strong south and westerly winds we get. 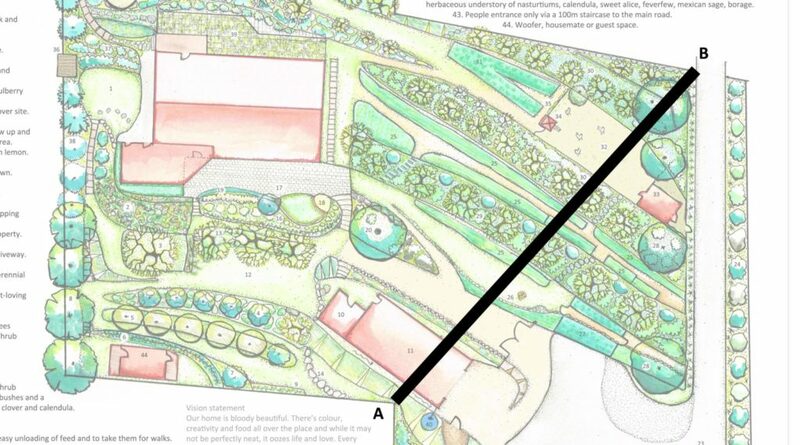 Our design response is to plant a thick forest garden in that whole corner to soften the heavy blows and put all the annual food production on the east side of the house where it’s more protected. Another one is our neighbour’s bush block on the east side of the property – this has the potential to be a fire hazard as there’s a large amount of dead wood and dense understory. Our design response is to (a) meet these neighbours (their house is actually a few hundred meters away from our place as they have a big block so we never see them) and (b) see if they’re open to us managing at least some of the bush for fire wood and possibly as grazing for the future milking goats we’d like to have (fingers crossed). With all this information in mind, we spent some solid time reading the landscape and balancing what we found out about the soil, water, access, vegetation and more with our own dreams, desires and capabilities. Somewhere within that we found what was possible for the land and us. To give you just a little sense of the steep slope we live on, you can see a profile of one section of the block below. 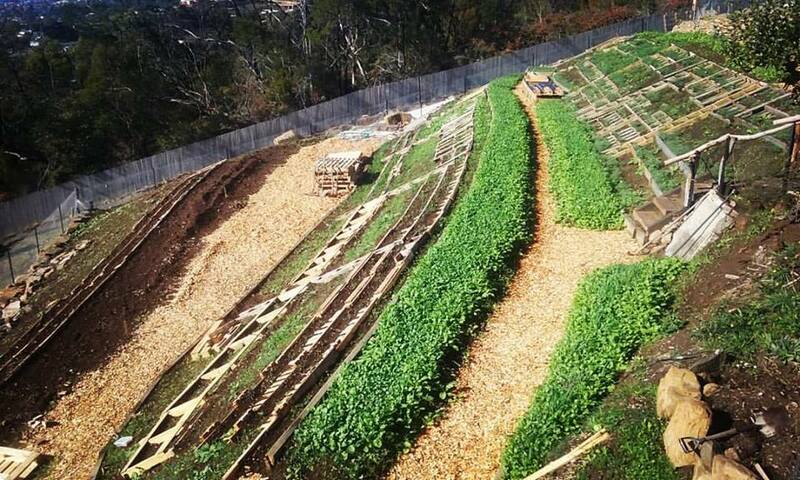 The pattern we adopted to work with this land is terracing so we can make it really functional – specifically for water management, access and food production. 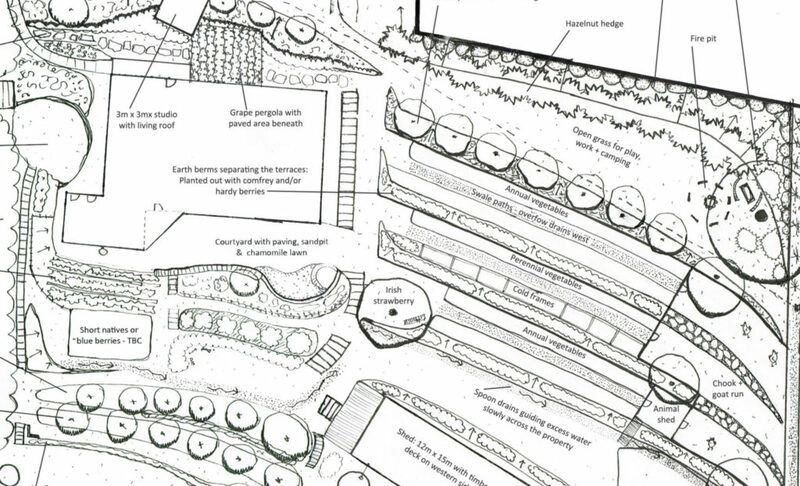 You’ll notice from one of our previous drafts (below) that we had originally designed a lot more flat space with deeper terraces. However when we showed it to Colin Fehre (our very fantastic excavator driver) he kindly explained to us that we’d have to remove a whoooole lot of earth offsite and build a whoooole lot of retaining walls to make it happen. 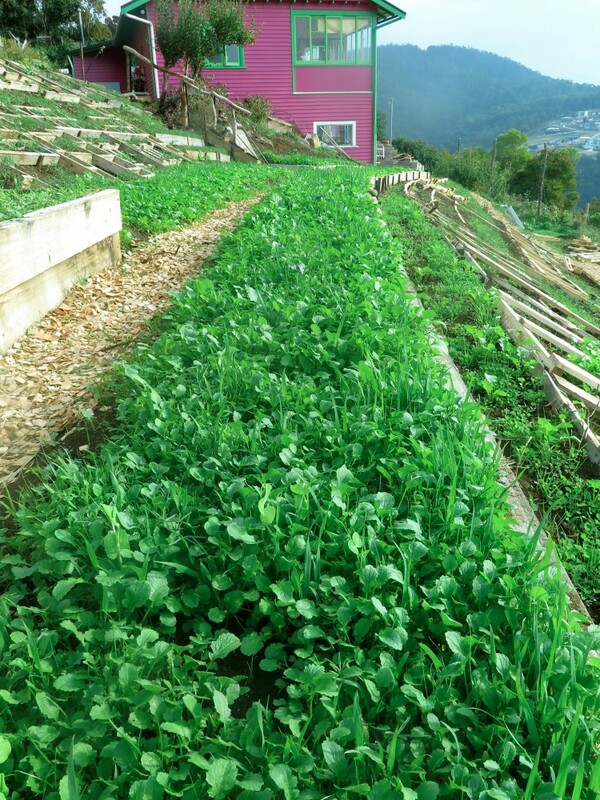 Ethically and financially we weren’t into this, so as you can see above we opted for earth berms with productive edible forest gardens stabilising them and smaller flat terraces for our annuals. 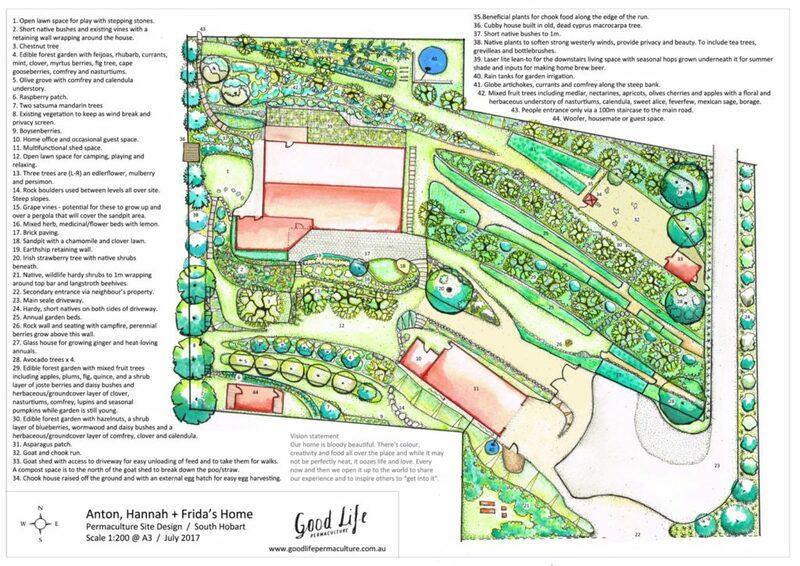 Long-term this is actually completely great as our landscape will be 70%-80% perennial food plants including nuts, fruit and veggies. Eventually this will give us a high, nutritious yield and require much less work than the annual veggies. So we’re happy. 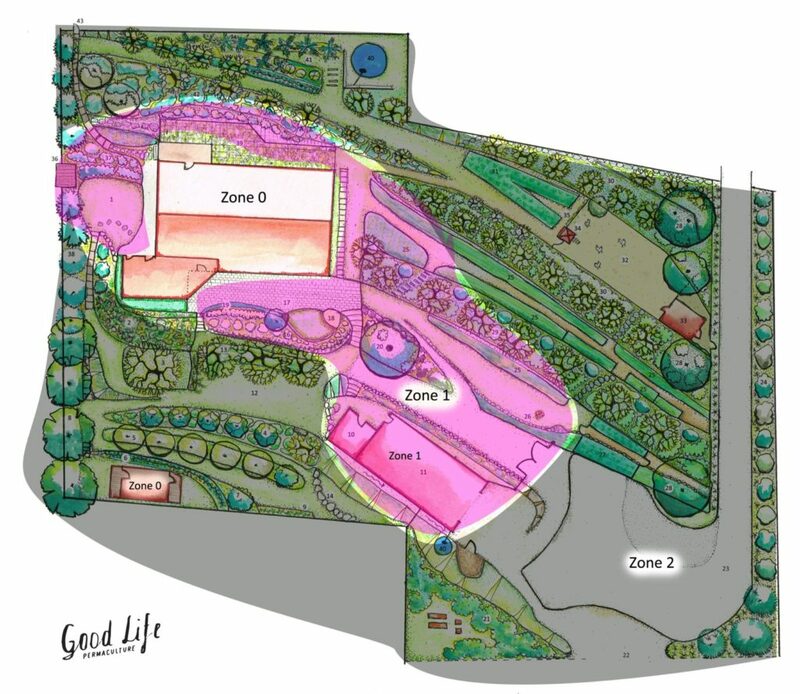 There are 6 zones in permaculture design (0-5), zone 0 being the main hub (i.e. 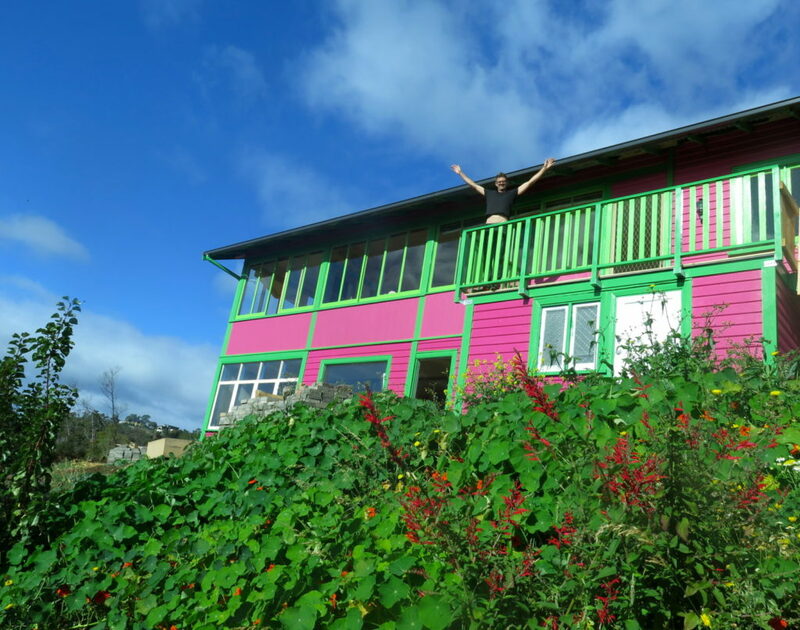 the house or work place) and zone 5 being the “wild/natural” space (furtherest away from zone 0). We have three zones at our home from 0 – 2. 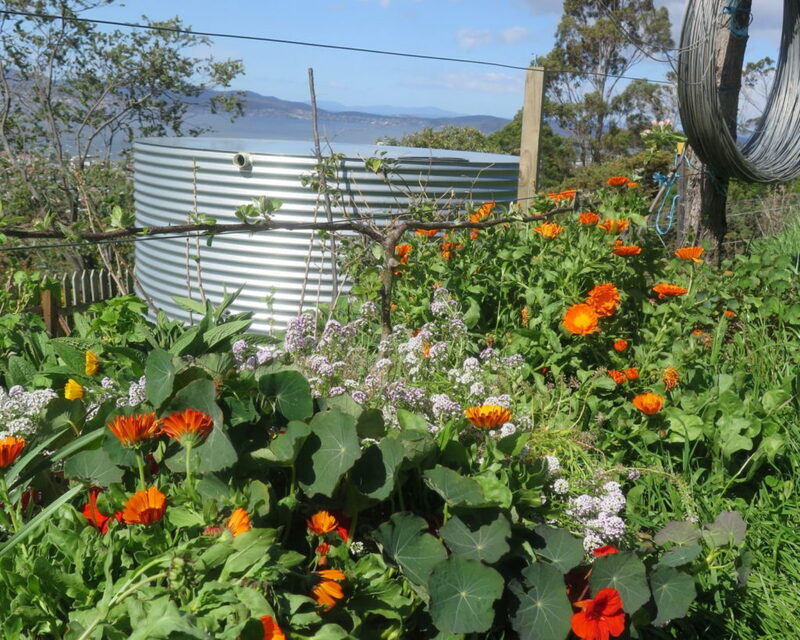 The only thing you really need to know about zones is that they are a tool you can use to place the things you need most often nearest to zone 0 (the hub of your property). This guarantees ultimate efficiency in how you lay out your property. That’s it. If you’d like to know more about zones, have a read of this. So that’s where we’re up to. We still have a long way to go with implementing everything we plan to, but the bones are firmly in place and are hearts are firmly set on making it all happen. So stay with us over the coming years and all shall be revealed! If you’re interested, you can read more facts and figures about our place over at David Holmgren’s Retrosuburbia and get a sense of what our place looks like in recent times below.